As soon as a new Android version is announced, forums and social networking sites are crowded with comments from impatient users inquiring about when their smartphones will get the OTA update and why the delay. To settle the issue, once and for all, HTC has provided with a detailed infographic describing what exactly goes behind the curtains before your smartphone receives the latest Android update. The smartphones have been categorized as carrier, unlocked and Google Playstore Edition smartphones and the number of steps involved in the updates are 12, 9 and 8 respectively. Most of the smartphones used in India are unlocked ones. The interesting thing to note is that Google provides OEM the PDK (Platform Development Kit) code before it announced the new Android version. Soon after this manufacturers evaluate the new platform and wait for the Chipset manufacturers to analyze the code. Yes, Google also provides the code to the chipset manufacturers and they have to decide if their chipset can handle the new Operating system and provide with supported drivers for the new platform. After the OEM receives the board support package (BSP) from the Chipset maker, the process of integrating this with the software starts. The update for each smartphone is tested thoroughly. After receiving passing certificates and Technical Acceptance (TA) certificate from Google, the update is loaded on OTA servers and pushed to customer devices. 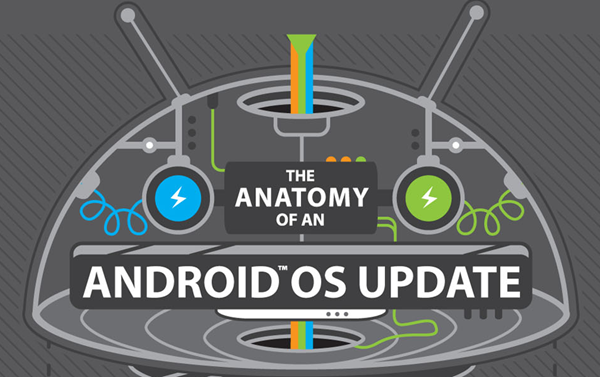 The infographic present below will show you the detailed description of the update process and will hopefully stifle the curiosity and criticism regarding the delayed KitKat update.